CAIRO — Al-Qaida's branch in Yemen has praised the killing of the U.S. ambassador in Libya and called for more attacks to expel American embassies from Muslim nations. Al-Qaida in the Arabian Peninsula said the killing this week of Ambassador Chris Stevens in an attack on the U.S. Consulate in Benghazi was "the best example" for those attacking embassies. It said protesters' aim should be to "expel the embassies of America from the lands of the Muslims" and called on protests to continue in Muslim nations "to set the fires blazing at these embassies." Egyptian police on Saturday cleared out protesters who have been clashing with security forces for the past four days near the U.S. Embassy as most cities around the Muslim world reported calm a day after at least six people were killed in a wave of angry protests over an anti-Islam film. Security forces erected a concrete wall blocking the main street leading to the embassy in Cairo after finally dispersing several hundred youths who had been battling with police, trying to get to the building. They also cleared nearby Tahrir Square where protests were being held. Muslims angry over the film produced in the U.S. denigrating the Prophet Muhammad took the streets on Friday in more than 20 countries from the Mideast to Southeast Asia. In most countries, protests were peaceful, if vehement. But deadly clashes erupted in several places, protesters in Sudan and Tunisia tried to storm Western embassies, an American fast-food restaurant was set ablaze in Lebanon, and international peacekeepers were attacked in the Sinai. In Cairo, the clashes Friday brought the first Egyptian to be killed in Tahrir Square protests since Islamist President Mohammed Morsi was elected and took office this summer. A 36-year-old died from wounds from rubber bullets, his family and doctors at a Cairo hospital said. Weeping relatives at the hospital held his 25-day-old daughter, named Ganna, or "Heaven." Two demonstrators died in Sudan, two died in Tunisia and another was killed in Lebanon. On Thursday, four Yemeni protesters were killed in protests that turned violent at the US Embassy in Sanaa. The only report Saturday of violence linked to the film came from Sydney, Australia, where rot police clashed with about 200 protesters at the U.S. Consulate. Ten Network television news showed a policeman knocked unconscious as the mostly male crowd hurled bottles and other projectiles. Police used pepper spray against the protesters, who chanted "Obama, Obama, we love Osama" and waved placards saying "Behead all those who insult the Prophet." Six police were injured and two protesters were treated for police dog bites police said in a statement. The anger was sparked by a film titled "Innocence of Muslims," which was produced in the United States and mocked the Prophet Muhammad by showing him as a fraud, a womanizer, a homosexual and a madman. A 14-minute excerpt of the movie, dubbed into Arabic, was posted on YouTube. The film has been described by Secretary of State Hillary Rodham Clinton as "an awful Internet video that we had nothing to do with." President Barack Obama said Washington would "stand fast" against attacks on U.S. embassies around the world. He spoke at a somber ceremony paying tribute to four Americans — including U.S. Ambassador Chris Stevens — killed Tuesday when the U.S. Consulate in Benghazi, Libya, was stormed by militants. The attackers are suspected of using protests of the anti-Muslim film to stage an assault on the 11th anniversary of the Sept. 11 terrorist attacks. Also on Tuesday, protesters swarmed up the walls of the U.S. Embassy in Cairo, bringing down an American flag and replacing it briefly with an Islamist banner. For days afterward, the protesters were in stone-throwing clashes with police firing tear gas. 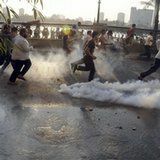 On Friday, the crowd of protesters grew to around 2,000 in the melee near the embassy and several large hotels that overlook the Nile River. The dwindling group of protesters was chased away Saturday morinng. AP writer Mohamed Saeed contributed from Khartoum, Sudan. Stop and think about it a little bit. We're now told that Ambassador Stevens was in a "safe house" (that the attackers somehow knew about)and embassy guards in certain areas were carrying empty guns. These are exactly the kind of orders that got our Marines killed in Beirut in 1983. Why do these idiots keep making the same mistakes over and over. Operational Security, and force protection have meaning! Learn the damn lessons taught! (09-15-2012, 05:18 PM)Brick Wrote: Stop and think about it a little bit. We're now told that Ambassador Stevens was in a "safe house" (that the attackers somehow knew about)and embassy guards in certain areas were carrying empty guns. Unless the only lesson to learn here is setup and sabotage from within to maintain the appearance of an active threat and keep the public in a state of terror. Tin foil hats or not there are some really fishy details here. I hope our troops have live ammo this time and shoot to kill orders.